Florida Democratic gubernatorial candidate Andrew Gillum has cut ties with a campaign aide and vendor who was caught on camera detailing why Gillum can’t deliver on some of his campaign promises. Gillum’s campaign responded by “severing ties” with Smith. Other people associated with Gillum’s campaign and the Florida Democratic Party were also secretly recorded by reporters from Project Veritas Action (PVA). Those recorded said Gillum is avoiding discussion of some of his more aggressively leftist positions, so as to not alienate moderate voters. Gillum and Smith went to college together, Smith said. 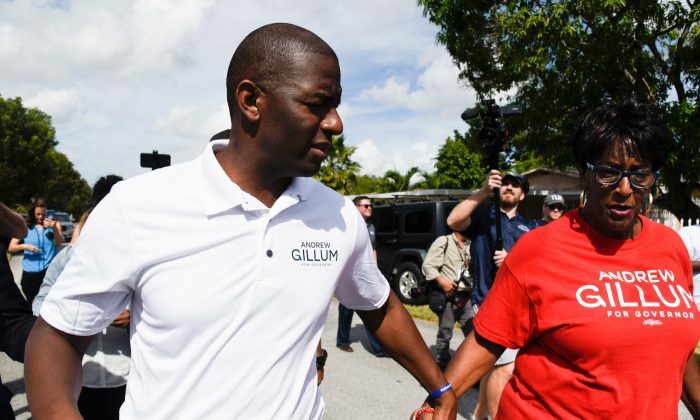 The two “were making a lot of noise” when they attended Florida A&M University, and Gillum was the Student Government Association president in 2001–2002. Both indeed attended the school at the time, according to Alumni.net records. Both remained politically active after college—Gillum as Tallahassee commissioner and later mayor, and Smith as a campaigner. The PAC spent about $8,000 and was stripped of its registration on Oct. 25 for a failure to pay a small fine. While PACs are forbidden to coordinate activities with candidates’ campaigns, PVA found Smith working at Gillum’s campaign office. The campaign stated he was a volunteer and vendor. Records show he was paid $4,500 in July by the Florida Democratic Party. 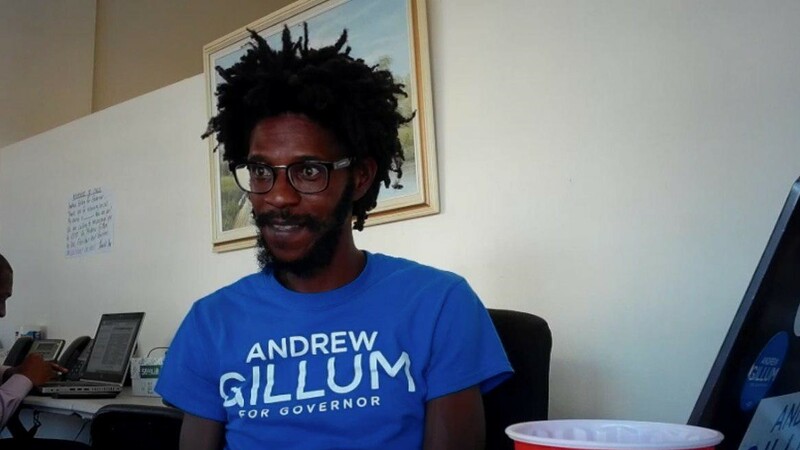 Smith appeared to possess deep insight into Gillum’s campaign. Gillum has promised Medicare for all, higher teacher salaries, and other spending increases. When asked by CNN who would pay for the Medicare plan, he said he “will absolutely not raise taxes on everyday working Floridians,” but would instead raise Florida’s corporate income tax to 7.75 percent, from 5.5 percent. “So, Omar, you’re saying that the corporate tax, he’s counting on the corporate tax to fund all the programs he wants to fund?” one PVA reporter asked Smith. “What if that doesn’t work out? What else would happen? How would he get the money?” she asked. “So none of the programs that people are hoping for would happen?” she asked. “Do voters know that?” she asked. “That’s not for them to know,” he said. A corporate tax of 7.75 percent would be the highest in the region—a likely no-go for the Florida legislature, where Republican majorities in both chambers push for attracting more businesses to the state. “We’re voting for him hoping that once he makes it, somebody else will pick up the fight to make sure that the proper legislators get in office when we vote again in August,” he said. In another conversation, the reporter inquired about what “progressive” means. “Progressive is like the Tea Party of the Democrats,” one unidentified campaign staffer is heard saying in the video. “You have to appeal to white guilt,” Smith said, seemingly in reference to how to convince voters to accept Gillum’s agenda. Before PVA released the video, founder James O’Keefe interviewed Smith, who said his comments were taken out of context, but didn’t elaborate when asked what the context was. “I would ask that you please not publish the video,” he said. Multiple attempts to reach Smith for a comment went unanswered. Gillum’s campaign responded to the PVA video by severing ties with Smith. PVA also found similar discrepancies between what candidates say publicly and what they and their campaign staff say privately in North Dakota, Missouri, and Arizona. So far, the videos only featured Democrats. Politicians commonly adjust their message for different audiences, emphasizing the points they think would resonate the most. What the latest PVA series shows, however, is that campaigns would intentionally try to avoid revealing certain policy positions to voters they feel may be alienated by what the candidates actually stand for.